Magnificent bust headless man giving full effect to the silhouette. They do not age and are designed for optimum life and low maintenance. This man bust can be painted in several finishes: matt, glossy (gloss lacquered), satin and what color you want. They are busts that easily adapt to the various displays and collections of the moment. 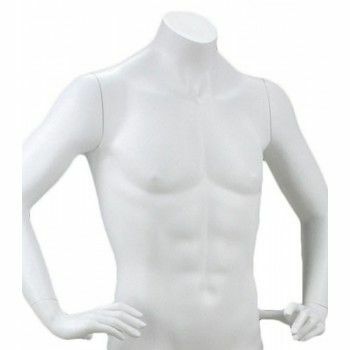 To customize your merchandising, Mannequins Online offers you these busts men in order to change your windows regularly. This beautiful bust man has a dual fixation and a square and adjustable chrome base. Its material is fiber glass.The dimensions of the bust are 93 cm in height, a shoulder width of 54 cm, a chest size of 97 cm, waist circumference of 77 cm and hips 97 cm.